Seward, is a southern seaport that is open year round. The first few days in the town, we watched two passenger ships (Holland America & Norwegian Cruise Lines) on consecutive days, cruise into their port right in front of our RV and disgorge an amazing number of passengers into the city. On the shorter cruises, the passengers return late in the day after touring the town and the ship departs about 9:00pm local time. On the longer cruises, passengers will take either a bus or train tour up to Denali, to Homer and other points of interest. Many nationalities were represented and of course some were on the Glacier Tour boat with us. The town’s modern history was shaped by the Good Friday, (March 27, 1965 at 5.36 pm) earthquake that lasted four to five minutes and killed 12 people. Rail cars fell off their tracks and those carrying oil ruptured, exploded and burned, setting the waterfront ablaze. The damage was compounded by a 10m (40 foot) tsunami that pounded the town thirty minutes after the quake. The aftermath resulted in the town clearing the lower area, creating parks (where we stayed) and moving all buildings to higher ground. Wooden pilings that once supported buildings are still visible along sections of the coastline. Apparently Alaska experiences, on average, 24 earthquakes a day, most of which are not felt. To make, life interesting, last Wednesday, (July 29th) at around 7:30 pm we experienced an earthquake, measuring 6.3 on the Richter scale, while in our RV. At first we wondered whether something had hit the coach, then we both concluded it must be an earthquake. We looked out at our neighbour’s van and it was bouncing up and down as if it was being driven over a very rough road. 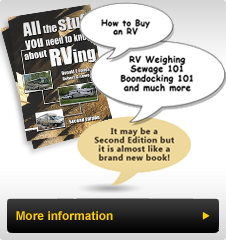 We stepped outside and watched the RV step move up and down a couple of inches, (of course the whole RV was moving up and down by that amount). Neighbours were outside, one with his hand on the corner of his RV, as if to see if he could feel whether it was shaking or not. All in all, a first for us, enduring an earthquake in our RV. We had noticed the Blue EDR signs, that at home provide notice of Emergency Disaster Route directions, however those signs here also include a warning to get to higher ground and point the way. 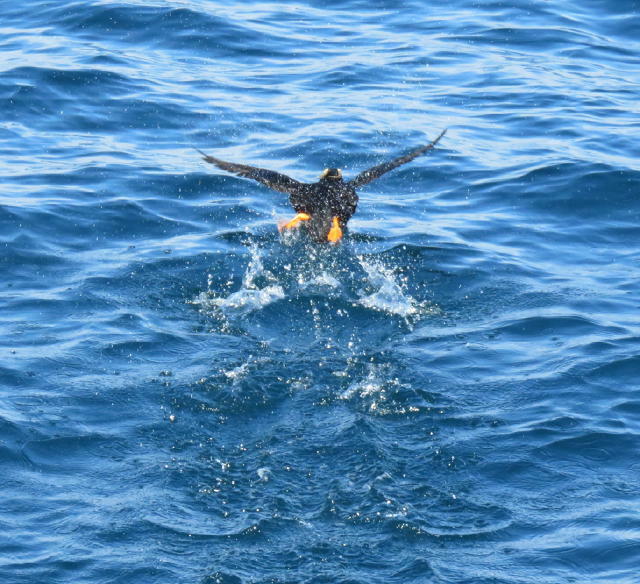 Something, that I have not talked about during our adventure, has been the variety of both sea and land birds. 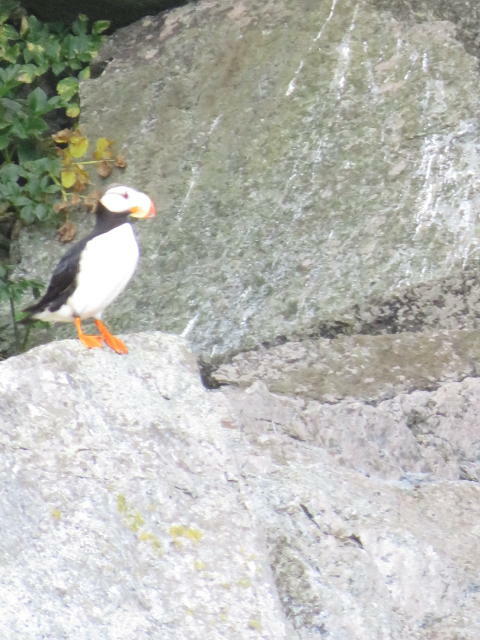 From the huge ravens and various sea birds, (sand cranes, gulls, terns, sandpipers, geese and loons) to some of the ones more likely only to be found in Alaska, to the many, unusual small birds. In our quest for the ‘large’ animals we often overlook these creatures and frankly, dismiss them. The truth is they often make for interesting encounters and are always present, everywhere we go. So, as we wrap up the time on the Glacier tour, I am enclosing a few photos of some birds that make Alaska more exciting. We were on a tour boat and many birds were on land, so the picture quality is not always the best, however you should be able to get an idea of what we saw. 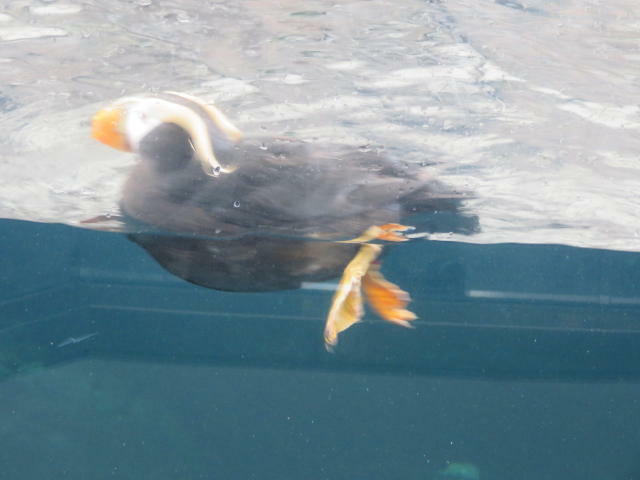 In the first slide you see a Horned Puffin, a bird often on the water (and under it as well). They live high up on clifftop burrows and when flying, their wings flap at up to 300 times per minute. 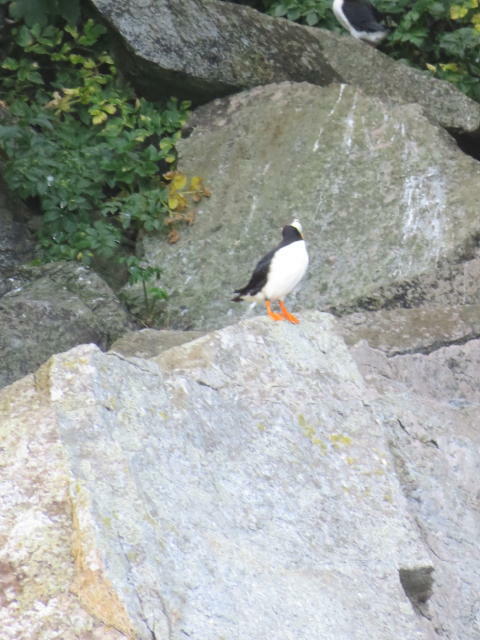 Puffins have a distinctive black and white colour with very orange legs and webbed feet. They are about twice as large as a Robin and walk upright. In Slide 2 you see a Horned Puffin which has a large horn like beak that locks on fish that it fly/dives and swims to catch. When on the water it tips forward, and uses its wings to dive hundreds of feet to catch its prey. We’ll catch up on this later. 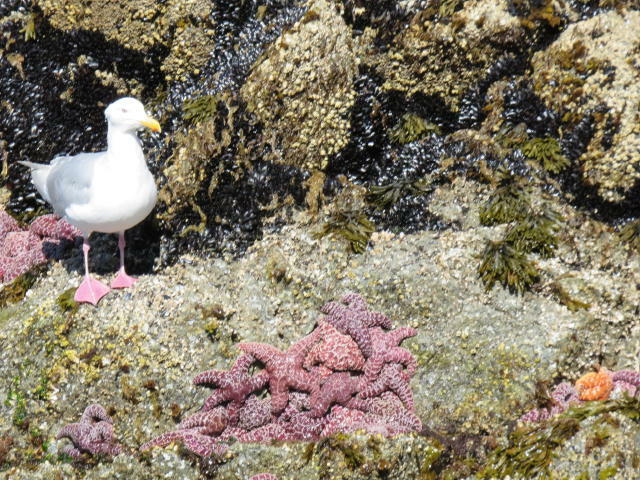 Slide 3 shows a number or sea stars (Star fish) that are exposed when the tide falls over 14 feet twice daily in this area. 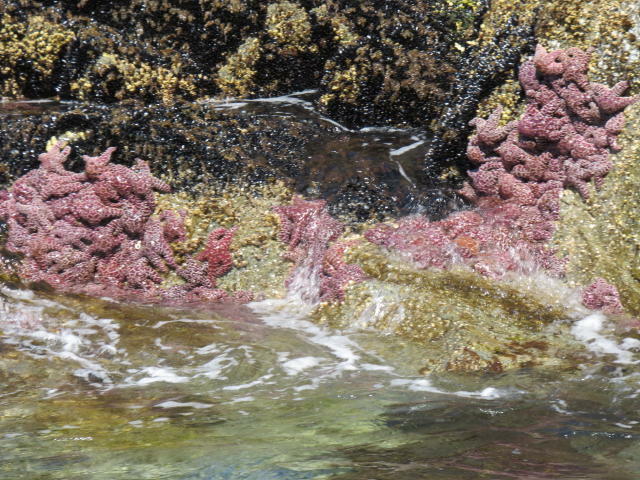 These stars are close to the surface in the sea weed, lichen and algae found along the shorelines. Slide 4 shows a large Mew Gull looking over the algae and sea stars. 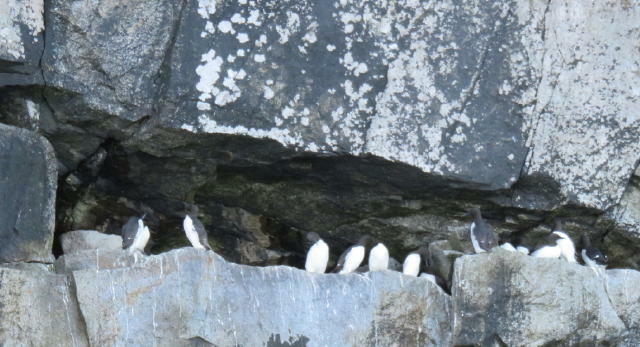 In Slide 5 we see a number of Common Murres high up in a seaside, cliff ledge. These birds live in colonies that are among the densest of any seabird. 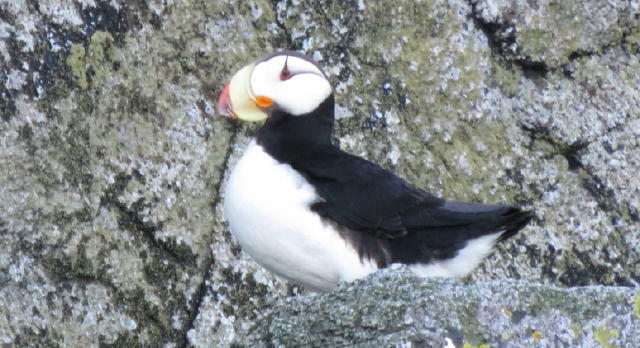 A Horned Puffin is shown up close in Slide 6 and you can clearly see the "horn” that is part of its beak. 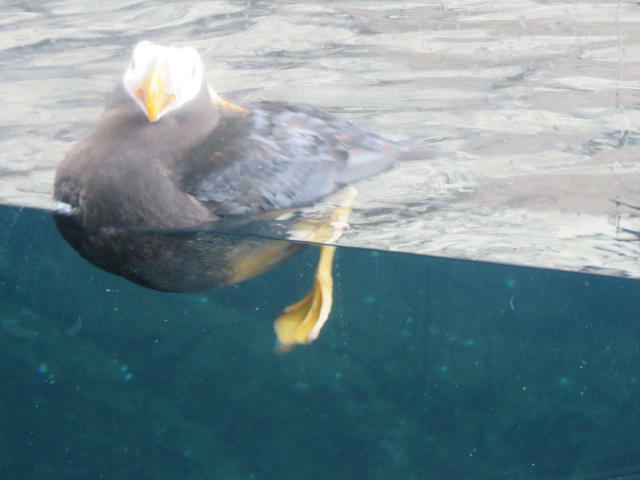 Slide 7 shows a Tufted Puffin about ready to make a dive for food. This bird is distinguished by two yellow tufts of hair (feathers) that flow back from the head which is more visible in Slides 12 and 13. 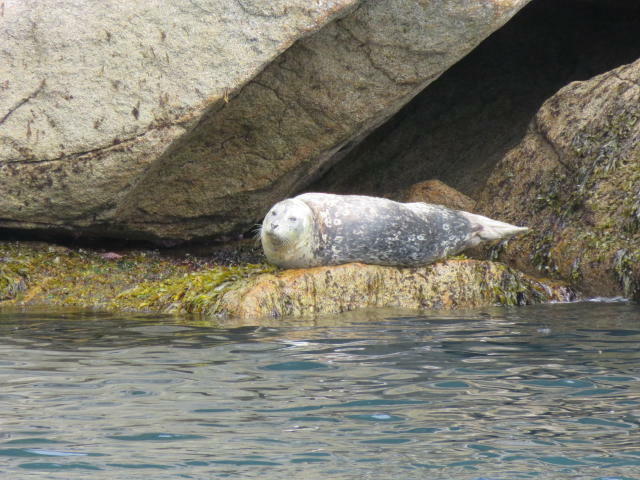 Slide 8 digresses to a picture of a Harbor Seal resting on a rock ledge and Slide 9 shows a pair of them. One of the interesting places to visit in Seward was the Alaska Sea Life Center which is an architecturally, beautiful building on the outside as well as inside. It was recently constructed and showcases various forms of sea life in a ‘close to natural habitat’. You can see this ‘life’ up close often above and below the water. Slide 10 and 11 show these seals swimming as we observed them in their area of the Center. You will see that they are swimming upside down and when two pass by each other they pass back to back. You wonder how they do it without hitting one another. Another mystery of creation that escapes us. 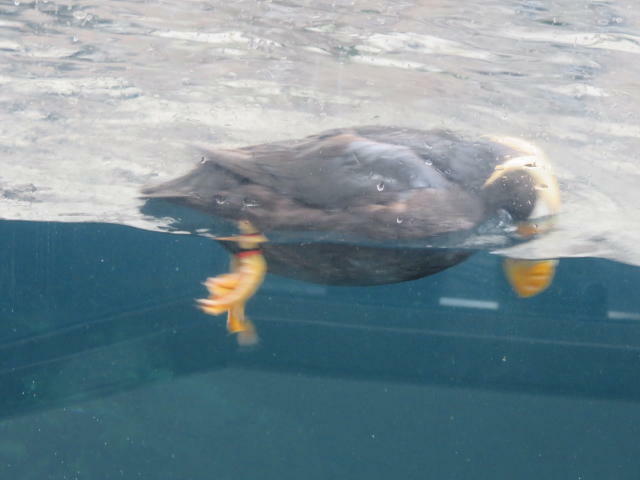 In this Center we could see the Tufted Puffin flying above, then landing and diving in the water. It was too quick for me to capture it diving. 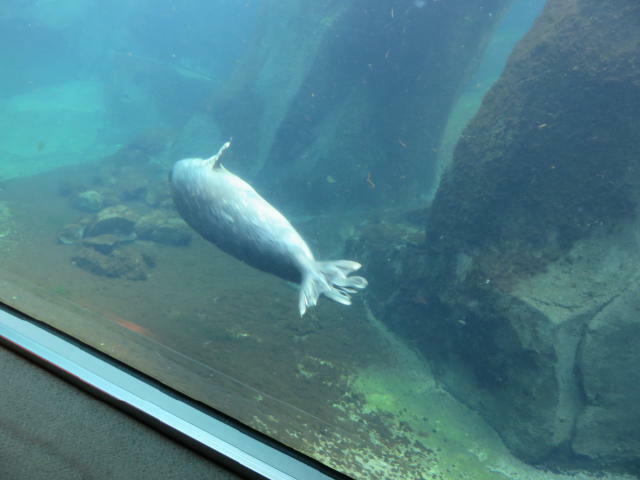 At one of the Sea Life displays, a diver went into a seal tank that mimics their natural environment, with a water area and an above water rock ledge area. This diver was able to talk while swimming in the tank, providing information live to us and a number of children who were there. What made it very interactive and interesting was that she could be asked questions from our position and she responded from the water. 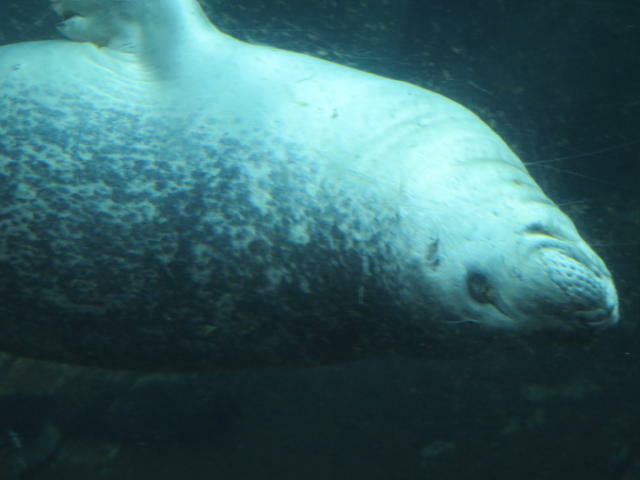 That made for some interesting dialogue as she responded to questions from young and old alike, while swimming in the tank with the seals. 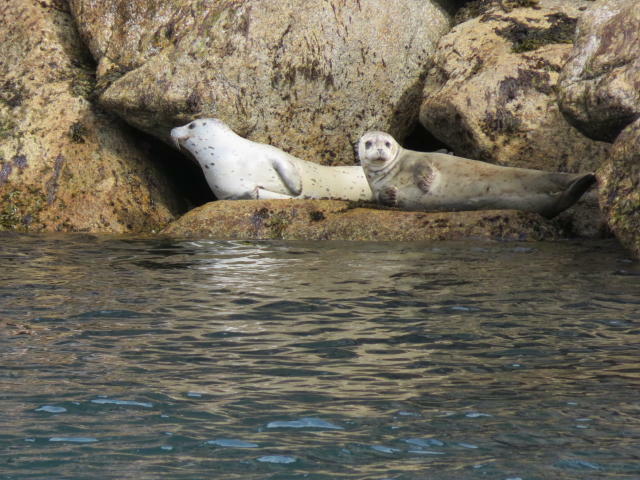 Other areas had sea otters, and Steller sea lions acting just as we saw them on the tour. Some were swimming and some were lounging on the rocks. Overhead were the many sea birds in habitats similar to theirs "outside”. Many of the behind the scenes displays provided a lot of information about the migration patterns of the sea life and the interdependency of the various sea life species on each other and the local environment. Breeding habits were presented in video and interactive displays. There were a number of aquariums with various fish from salmon to sea stars to countless unusual shell fish and those that occupy the floor of the ocean, together with the plant life that supports them all. It was a fascinating place to visit and gave us a much larger picture of some of the life underwater and especially under the seas in Alaska. All in all a fitting way to conclude our visit to Seward.